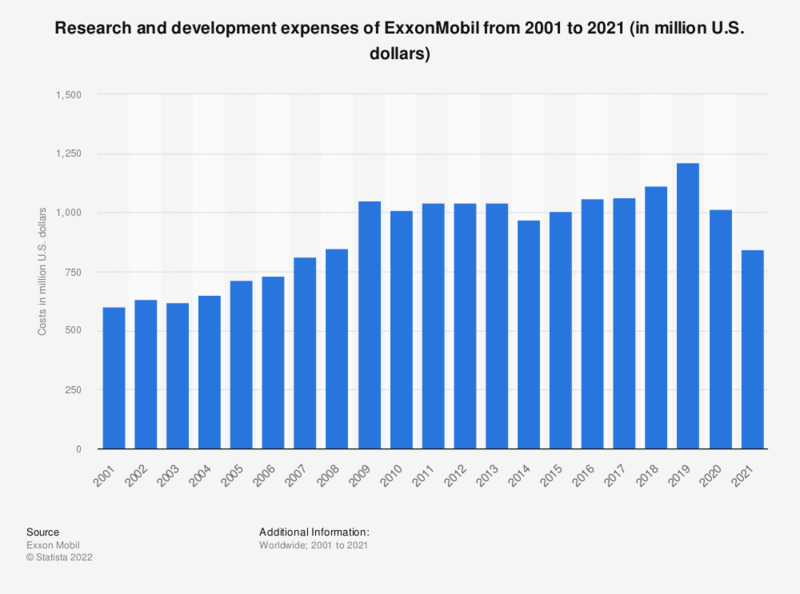 This statistic outlines the research and development costs of ExxonMobil from 2001 to 2018. In 2018, ExxonMobil's research and development costs amounted to 1.12 billion U.S. dollars. ExxonMobil is a United States-based multinational oil and gas corporation headquartered in Irving, Texas. The ExxonMobil Corporation is a U.S. oil and gas corporation, headquartered in Irving, Texas. It was formed in 1999 through the fusion of Exxon and Mobil, previously known as Standard Oil of New York and Standard Oil of New Jersey respectively. The company traces its roots back to John D. Rockeffeller’s Standard Oil Company, which was founded in 1870. Today, ExxonMobil is one of the largest companies in the world. According to the Financial Times, ExxonMobil is the world’s number one oil and gas company based on market capitalization. As of 2018, ExxonMobil had a market capitalization of some 283 billion U.S. dollars. Based on 2017 revenue, ExxonMobil was the ninth largest company worldwide, topped by Wal-Mart, State Grid, Toyota, Volkswagen, and four other oil and gas companies: Sinopec, China National Petroleum, Royal Dutch Shell, and BP. Research and development expenditure in the oil and gas industry is not as high as in some other major industries. For example, the chemical industry spends around three percent of its revenue for R&D purposes. Pharmaceutical companies spend even more – often between 15 and 20 percent. In 2018, ExxonMobil spent around 1.1 billion US dollars on research and development. One decade earlier, in 2008, this figure stood at some 847 million U.S. dollars. However, oil and gas companies like ExxonMobil always have to cover exploration expenses. In 2018, these costs came to some 1.47 billion U.S. dollars for ExxonMobil.